I come from an Italian background. My dad's side of the family is full-fledged, pasta-eating, loud-talking Italians. And it's one of the things that I love about my heritage. I love the tradition and family-focus of the culture. And the holidays. Italians know how to celebrate the holidays. Every year on Christmas Eve, I attended a legit Feast of the Seven Fishes. Nevermind that I hate seafood and wouldn't eat it. It was a festive affair, with a house crammed with lots of people and good food (don't worry, there was pasta for me to nosh on. With Italians, there is always pasta). Everything about it was celebratory and fun. One aspect of Italian holidays that give me the warm fuzzies to this very day is Christmas Cookies. And not just any Christmas Cookies. I'm talking Pizzelles. 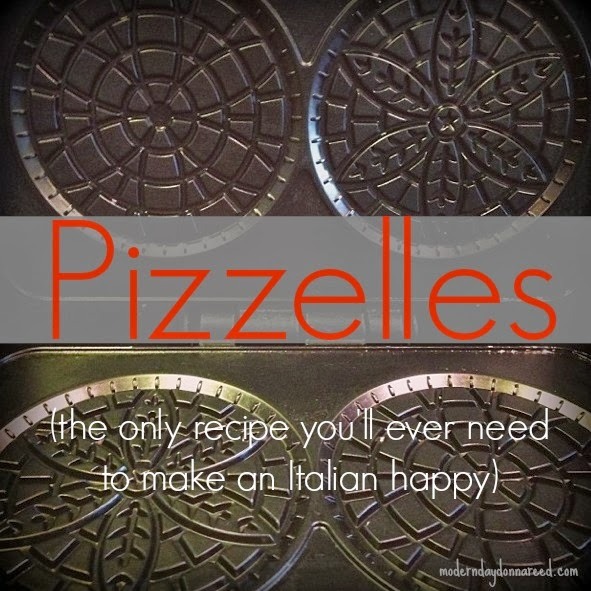 I was surprised to find that growing up, many of my friends had no idea what pizzelles were. They were a staple at my grandparents house, especially during Christmas. There would be huge tins filled to the brim with these delicate lacy anise-flavored wafers. I could eat them by the dozen. And often did. 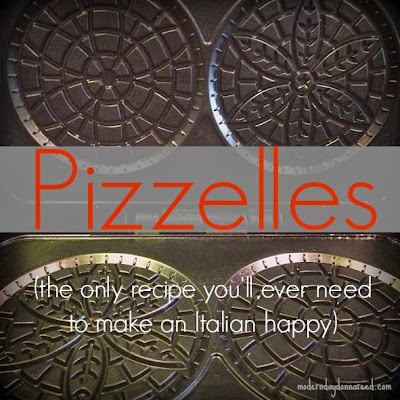 If you are new to Pizzelles, your first step before even reading the recipe is to procure a Pizzelle iron. Granted, the best irons are old and seasoned from years of use. I had to settle for receiving one as a wedding gift, but who am I to look at gift horse in the mouth? I have the Cuisinart Pizzelle Press , but if I could have done things differently, I would have registered for the CucinaPro Pizzelle Baker . Both irons will get the job done. And this recipe is about as authentic as it gets, people. This is the recipe I grew up on and cherish and will eat by the dozen, despite the amount of butter and sugar involved. Mix all the ingredients together and put it the refrigerator to set for 15 minutes while the iron heats up. Grease your pizzelle iron and use as directed (see below for tips). Let the iron heat completely before starting, and grease the iron before putting the batter on. You only need a tablespoon or so of batter on each imprint. It may not seem like it will fill the space, but it will spread. The first few may be too light or too dark, but once you do a few, you'll get the hang of exactly how long to let them bake before scooping them out. Lay them on a flat surface to cool and set. Some people add cocoa for a chocolate version, but that's not how I roll. You can also cool them around a tube to make them into the shape of a cannoli shell and fill it with melted chocolate or sweetened ricotta cheese. I think this year I may dip mine in Nutella. What is YOUR favorite holiday cookie from childhood?